Developing international market strategies for your Asian built products. Domestic Shipyard / Marina development and modernization. Develop your interior design and fitting procedures to International Yacht Standards. Work closely with Classification Societies e.g. ABS, LLOYDS, DNV, RINA, CCS, BV,etc. Virtual as well as On Site bilingual Consultation. Accurate On Site and Virtual Office representation of your company. Traditional or "State of the Art" CNC tooling for any sized FRP vessel or interior application. Accurate well written, bilingual technical reports and marketing presentations. Recommending and locating established International Yacht or boat dealerships and distribution networks, exactly suiting your needs. Arrange invitations and face to face introductions to well known and highly respected members of the International Yachting Community. Supply your Asian Company with a hungry International Market. Identifying what sells or doesn't, and reporting demography. Knowledgeable representation at Domestic and International Boat Shows, Exhibitions, and Trade Fairs. 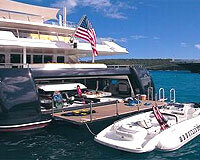 Establishing and filling Yacht related Human Resource needs regardless of the requirement. Matching and introduction to the right International Naval Architects and Interior Designers who are willing and capable of accomplishing your needs. Yacht Consultants Asia (HK) Ltd's International network of Yacht equipment manufacturers and suppliers, is the product of 4 decades of Yacht building...we know where to get the products not available in Asia and who to buy them from.